Sunlight shines onto your solar panels, which ideally should be pitched in northerly direction. 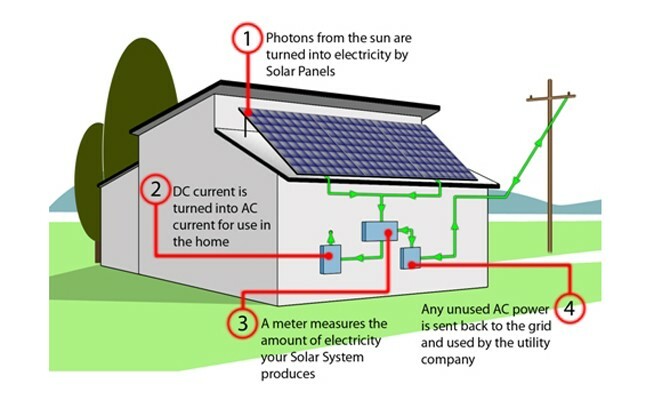 The Direct Current that is generated through the panels is sent to your Inverter to convert to an Alternating Current, which your home or business uses. The new generated electricity is now available to power your property. Your electricity meter measures the amount of power you consume. The difference between the electricity generated by the solar system and the electricity consumed off the grid is measured. Any excess electricity is sent back to the grid and used by your electricity utility company. Your energy retailer will apply credits to your power bill. Energy retailers will manage your electricity usage in different ways, however they are all regulated to ensure you will receive any credits applicable. Click here for more information on Energy retailers in Australia. For further information on solar go to the Clean Energy Council website.